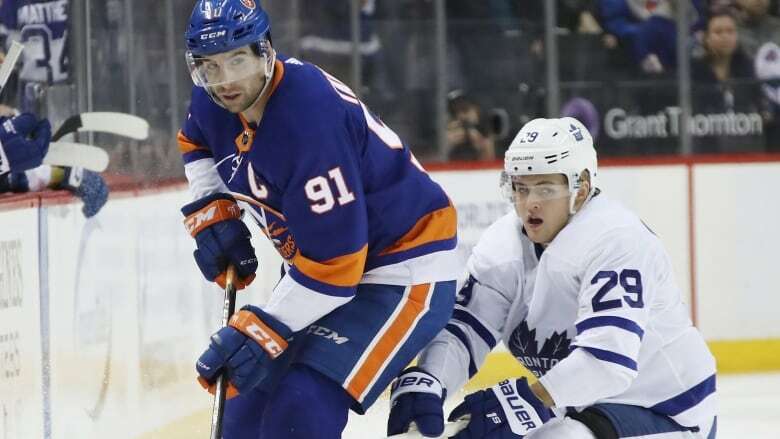 With clock ticking down to training camp, Toronto's new star centre John Tavares is confident winger William Nylander will be there when the Maple Leafs hit the ice for real later this week. John Tavares got a glimpse of William Nylander's skill at informal practices and scrimmages this summer. With clock ticking down to training camp, Toronto's new star centre is confident the winger with silky-smooth hands and a bullet shot to match will be there when the Maple Leafs hit the ice for real later this week. Nylander, a restricted free agent, remains unsigned with players set to report for physicals and testing Thursday before the team travels to Niagara Falls, Ont., to get down to business the following morning. As of now, the 22-year-old Nylander won't be making the trip. "Willy's obviously a big part of the team and a big part of the future," Tavares said Monday. "Guys in this situation, it always seems to come down to the wire a little bit. We believe we're going to have Willy here to start camp. "Hopefully it can get done very soon and we can get him in." Nylander had 20 goals and 41 assists in 82 games in 2017-18 for Toronto, including the club's second-most points at even strength with 49 (15 goals, 34 assists). In 185 career games, he has 48 goals and 87 assists, with back-to-back 61-point seasons. While the Leafs have more than US$13 million in projected salary cap space, the club still has to sign Auston Matthews and Mitch Marner, who can both hit restricted free agency next summer, in the not-too-distant future. Nylander has said he wants a long-term deal, but a shorter agreement is also an option. It's something Toronto centre Nazem Kadri knows all about after he inked a two-year contract worth $5.8 million as a restricted free agent on the eve of camp in 2013. "It's a little bit stressful — I know in my case it was — and they are very similar," Kadri said when asked about Nylander's situation. "I know Willy wants to be here." Kadri would then sign a one-year, $4.1-million contract for 2015-16 before eventually coming to terms on a $27-million package over six seasons that tied him to Toronto through 2021-22. "It's not the easiest thing to go through," Kadri added. "(Nylander's) a great player, he's a great teammate. "We love to have him around." Tavares, Kadri and a number of other Leafs attended the team's annual charity golf tournament Monday — no golf was actually played because of heavy rain — and were also asked about chatter from the outside that has Toronto pegged among the favourites to hoist the Stanley Cup in June. "That's what happens with good teams," Leafs defenceman Morgan Rielly said. "Once you become an established team and players get comfortable and a bit more experienced, you start to believe in yourself. You start to have bigger goals, and that's certainly what's happened here." "We want to be a contender for years to come, but we've got to earn the right to do that," added Kadri, who's coming off consecutive 32-goal seasons. "No team's going to give it to us or hand it over. "Over the last few years this team has headed in the right direction, and the direction we've wanted to go in. A lot of hard work's gone into that behind the scenes." Part of that work was securing Tavares to a massive seven-year, $77-million contract when free agency opened July 1. The former New York Islanders captain had spent his entire NHL career in the Big Apple before the stunning move to play for the team he grew up supporting. He said so far life in even more of a spotlight hasn't been much different. "I've been able to just be myself and life my normal, daily life," said Tavares, who was raised in nearby Oakville. "That was a really big thing for me. I didn't really want to change the way I live and who I am and the way I go about things. People have been fantastic. "There's been plenty of days I've gone out and haven't been recognized." The impressive centre trio of Tavares, Matthews and Kadri should immediately present problems for opposing teams as Toronto looks to build on back-to-back opening-round playoff exits with its first series victory since 2004. "I'm excited to watch it," Rielly said of his team's depth down the middle. "I'm not envious of those (opponents) that will have to match up." That impressive forward group is, however, still missing one key piece. "(Nylander's) a great player and he was a big part of our team last year," Rielly added. "There's time between now and camp, so who knows? "Hopefully he comes on board. If so, we'll be happy. But if not, you just carry on."